The Arbor Day Foundation has named Indiana State University a 2011 Tree Campus USA in honor of its commitment to effective community forestry management. Indiana State achieved the designation for the fourth year in a row by meeting the required five core standards for sustainable campus forestry: a tree advisory committee, a campus tree-care plan, dedicated annual expenditures for its campus tree program, an Arbor Day observance and the sponsorship of student service-learning projects. "Students throughout the country are passionate about sustainability and community improvement, which makes Indiana State University's emphasis on well-maintained and healthy trees so important," said John Rosenow, chief executive of the Arbor Day Foundation. "By achieving Tree Campus USA recognition, Indiana State will continue to set an example for other colleges and universities and give students a chance to give back to both their campus community and the community at-large." The tree canopy on the ISU campus survived the past two years of summer and fall drought very well, said Stephanie Krull, landscape and grounds manager for the university. The campus is also incorporating more native plants in its outdoor spaces, a move that is good for tree diversity and tree health, she said. Krull said student interest in preserving the university's trees has expanded. "I've had many more students interested in working with grounds maintenance, volunteering or doing community service with us, and generally being interested and grateful for the tree canopy and keeping it a priority," she said. "I am really excited about this, and look forward to this year's growing season so we can enjoy all the benefits our tree canopy provide: shade, fragrance, beauty, comfort and energy." In conjunction with ISU's April 20 observance of Donaghy Day, part of the Global Youth Service Day, volunteers will be planting 100 shade trees at a new university tree farm east of campus. Grounds maintenance crews will dig holes for the trees, so planting and watering will be the main task for volunteers. Tree Campus USA, a national program launched in 2008 by the Arbor Day Foundation, honors colleges and universities and their leaders for promoting healthy trees and engaging students and staff in the spirit of conservation. Indiana State was among 29 colleges and universities to receive the recognition in the program's first year and was the first Tree Campus institution in Indiana. Tree Campus USA is supported by a generous grant from Toyota. During 2011, the Arbor Day Foundation and Toyota helped campuses throughout the country plant 30,000 trees, and Tree Campus USA colleges and universities have invested more than $22 million in campus forest management. More information about the Tree Campus USA program is available at www.arborday.org/TreeCampusUSA. 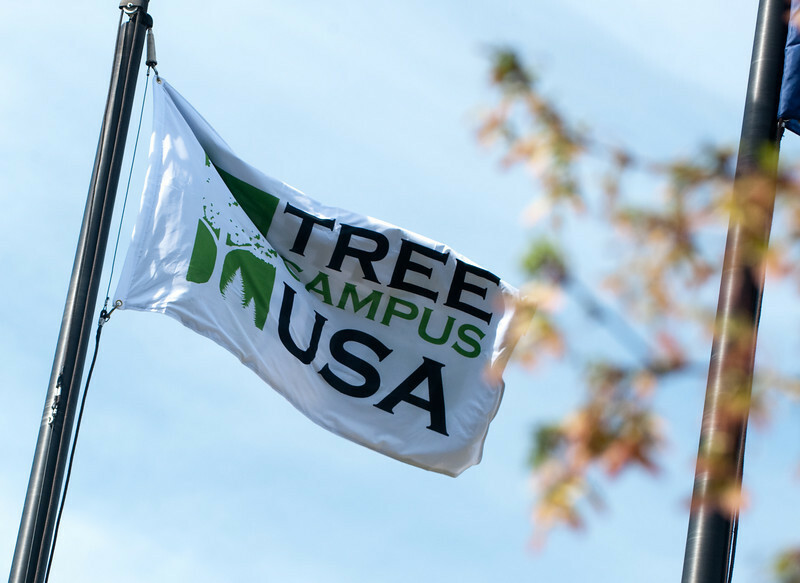 Photo: http://isuphoto.smugmug.com/Events/Tree-Campus-USA-flag-raising/042309treeUSAcampus-142-of-218/519229895_PP52V-L.jpg - The Tree Campus USA flag will continue to fly at Indiana State University. The Arbor Day Foundation has recognized the university's commitment to preserving its campus tree canopy for the fourth straight year. Contact: Stephanie Krull, landscape and grounds manager, Facilities Management Department, Indiana State University, 812-237-8160 or steph.krull@indstate.edu. The Arbor Day Foundation has named ISU a 2011 Tree Campus USA in honor of its commitment to effective community forestry management.